adapted from Nick Malgieri’s Instant Puff Pastry recipe in The Modern Baker; Note that one batch of this dough is approximately equivalent to 4 x 397 gram boxes of store bought frozen puff pastry. 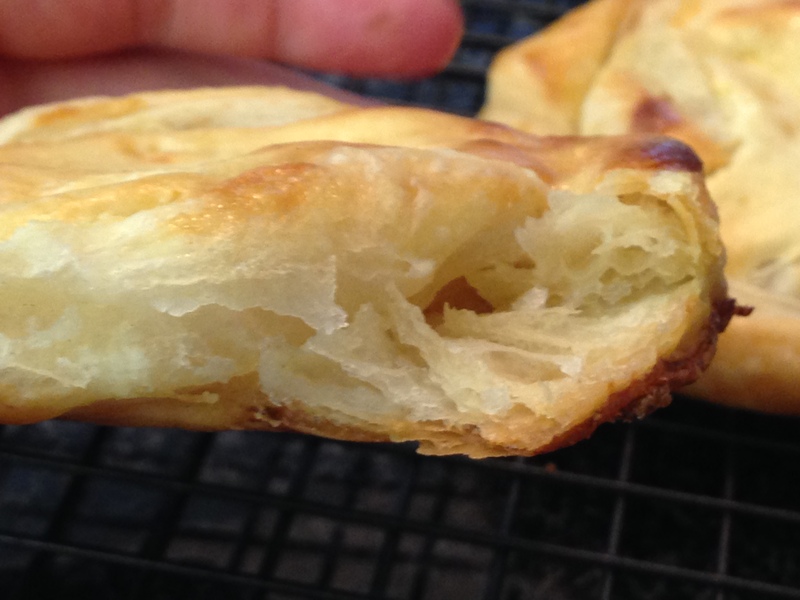 This puff pastry can be made well in advance and frozen for future use. In the bowl of a large food processor fitted with a metal blade, pulse the flour and salt until combined. If your food processor is too small, you may need to do this in two batches. With the following steps, it is very important to work quickly and to keep all of your ingredients chilled in the refrigerator when not in use. Otherwise, the butter will melt and you will end up with a wet mess. If this happens at any point, simply gather the wet dough, wrap it in syran wrap and chill it through in the refrigerator until it is firm enough to work with again. Add the butter to the flour in the food processor and pulse a few times until most of the large chunks of butter have been broken down into pea sized pieces. Then, with the motor running, add the cold water in a steady stream. Only process long enough for the dough to come together. Dump the dough out onto a well floured and large work surface. Knead the dough a few times and form it into a rectangular shape. Dust the top of the pastry generously with flour and then use your rolling pin to press down on the dough until it has roughly flattened out. It is important not to roll the dough out at this point, simply use the rolling pin to press down on it. Lift the dough off of the counter and turn it 90 degrees. Re-flour the work surface and the top of the dough as necessary. Then use the rolling pin to press down on the dough again until it is more evenly flattened. Now use the rolling pin to roll the dough out into an 18 inch x 18 inch square. Use a sharp knife to cut the square in half so that you have two rectangles, approximately 9 inches x 18 inches each. Work with one rectangle of dough at a time. 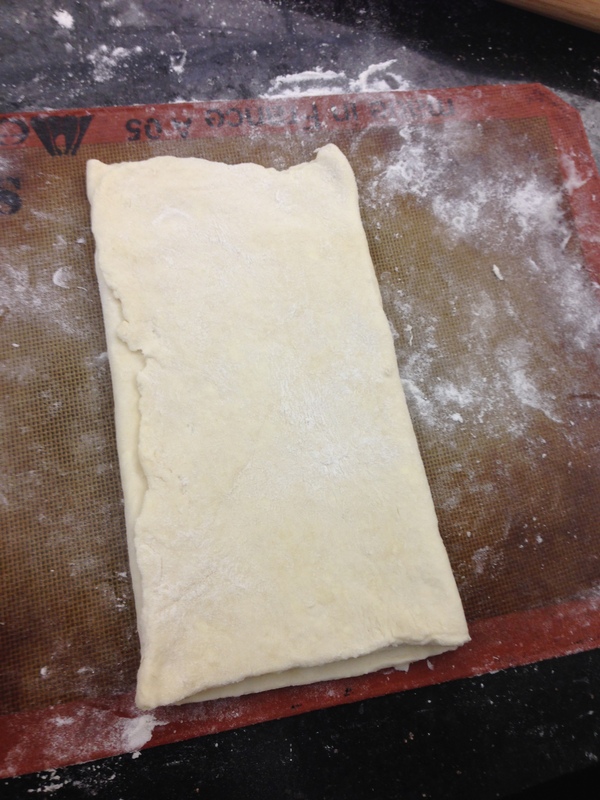 Roll one piece of the dough out into a 12 inch x 18 inch rectangle so that the longest side runs vertically. Then imagine dividing the dough into thirds, lengthwise. Pick up the left side of the dough and fold it over the the middle third of the dough. 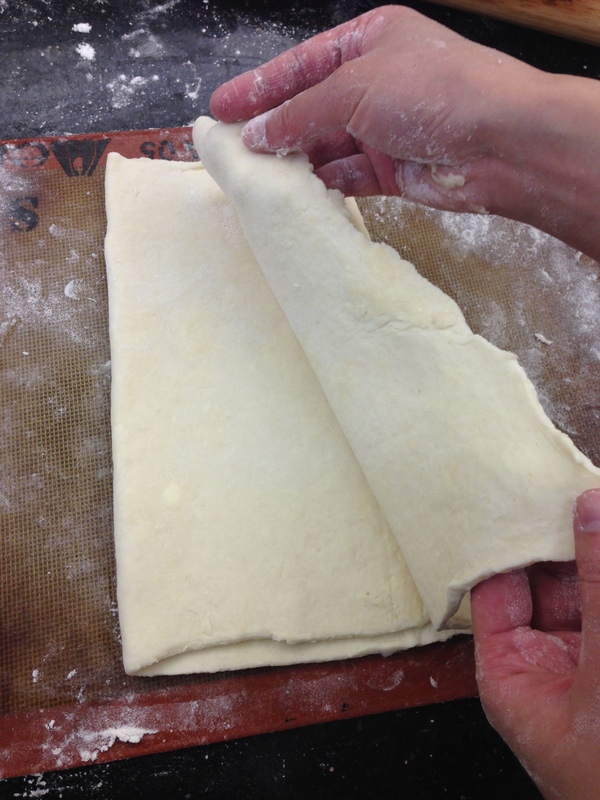 Then pick up the right side of the dough and fold it over the first fold. The dough should now be one third of the width and it should have three layers of folded dough. 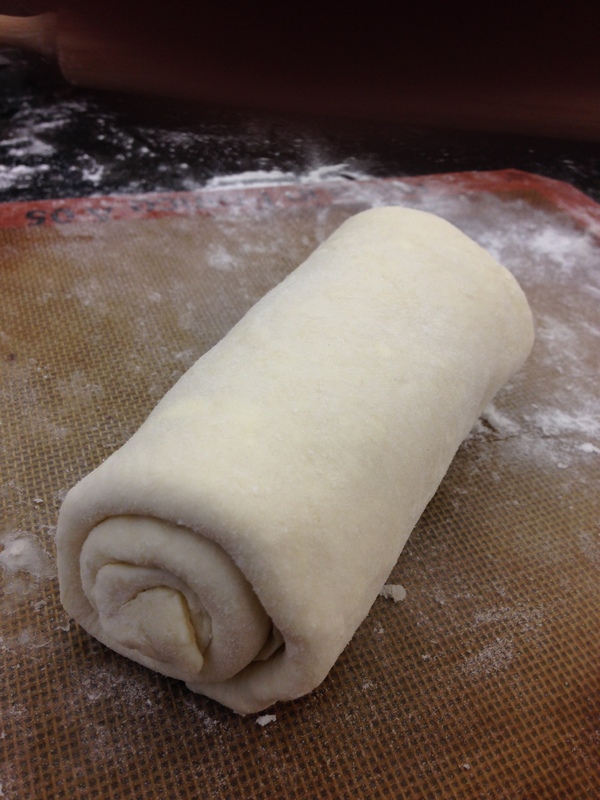 Starting with the bottom end of the dough, roll it up tightly all the way to the other end. Pinch the edge closed and place the dough seam side down. 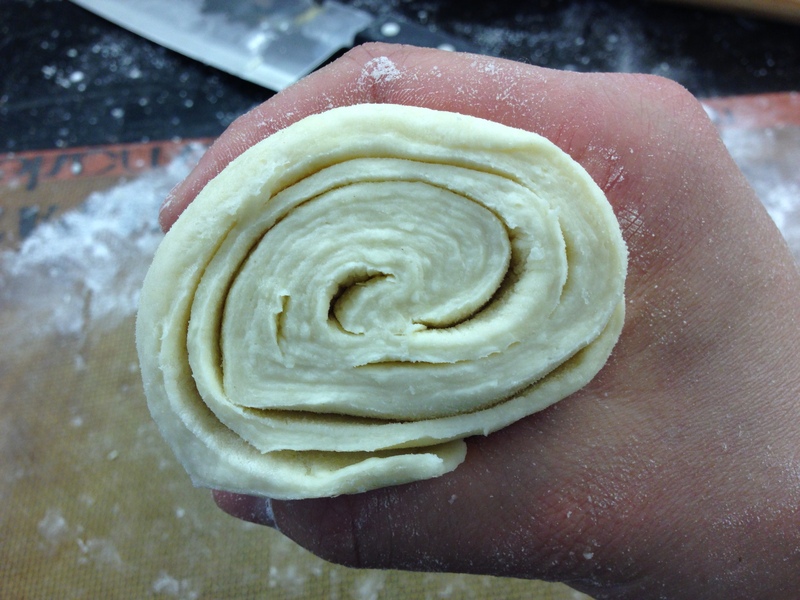 At this time, the top should be smooth and the spirals should be visible from both sides of the dough. Use the palm of your hand to gently press down on the dough. Then use a sharp knife to cut the dough in half, lengthwise, i.e. not cutting across the visible spirals. Wrap each piece of dough in syran wrap and refrigerate for at least 2 hours prior to use. You could also freeze the puff pastry (after it has chilled in the refrigerator for at least 2 hours) and defrost in the refrigerator prior to use another day. Repeat these steps with the other rectangle of dough.